The U.S. apparel market is the largest in the world. In 2016, store-based retailing was valued at approximately 292 billion U.S. dollars. Retail sales in clothing stores in the United States regularly exceed 15bn U.S. dollars on a monthly basis. In December 2017, U.S. apparel retail store sales amount to 23.3 billion U.S. dollars. The revenue of the women's and girls' apparel market was approximately 117 billion U.S. dollars in 2017, whereas the revenue of the men's and boys' apparel market was around 87 billion U.S. dollars in the same period. In terms of apparel brand companies, Gap had the largest share of the market, as of 2016, with 4 percent. One of the dominant players in the apparel market is Nike. Nike posted revenues of 4.89 billion U.S. dollars from their apparel segment in North America in 2017. 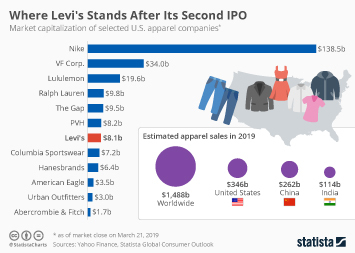 The U.S. apparel market is always changing, attempting to adapt to customer trends and new technology that will allow the consumers' shopping experience to be more enjoyable. Topic: Footwear market in the U.S.
More interesting topics from the industry "Clothing & Apparel"